Location: In farmland to the west of Tibbs Cross Lane. 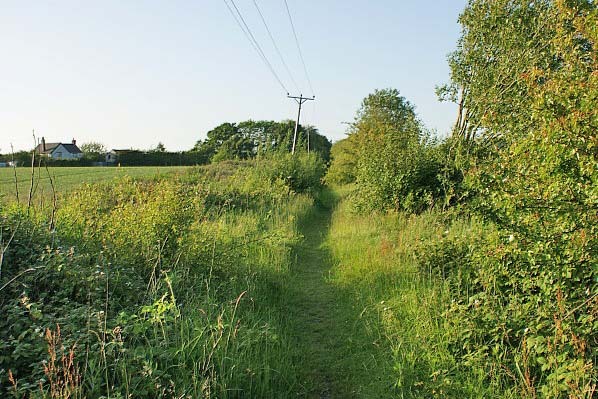 A public footpath runs through the site. 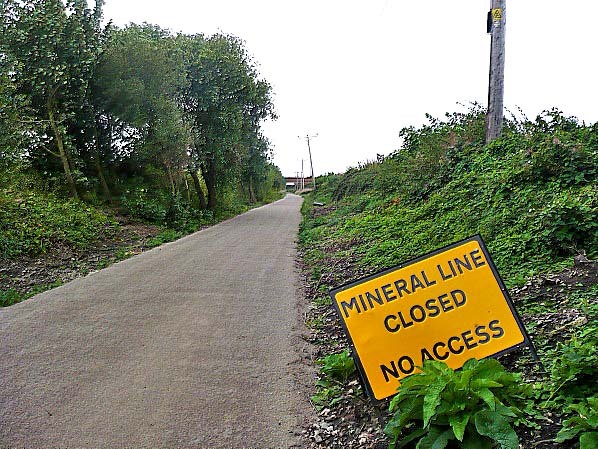 Notes: Union Bank Farm Halt was situated on the Widnes and St Helens line which opened on 21 February 1833 as the St Helens & Runcorn Gap Railway (SH&RGR). Built primarily for the movement of coal from the St Helens Coal field to a dock on the River Mersey (Widnes Dock) at the Runcorn Gap the line did carry passengers from its first year of operation, but there were no intermediate stations between the dock and St Helens. On 21 July 1845 the SH&RGR became the St Helens Canal & Railway Company (SC&RC) when it merged with its competitor the Sankey Canal Company. In following years the original line was improved through doubling and the elimination of two inclined planes, and the overall network of the SC&RC expanded. From June 1850 intermediate stations were provided along the line, and passenger services improved. On 31 July 1864 the SC&RC was taken over by the London & North Western Railway (LNWR). Union Bank Farm Halt was opened by the LNWR on 1 November 1911 to serve a ‘Railmotor’ service which was introduced on the same day. The Railmotor was a single coach steam powered vehicle that was cheaper to operate than a conventional locomotive with coaches. The halt was in a remote spot between the existing stations at Farnworth & Bold and at Clock Face. It was close to Union Bank Farm and served a number of isolated farms. The line was double track so the halt was provided with two short wooden platforms that had basic waiting shelters. Access was via a lane that connected from the St Helens direction platform onto the Prescot to Warrington Road which lay to the south of the halt. On the east side of the line a footpath led from the Widnes Direction platform over fields to Tibbs Cross Lane. The ‘Railmotor’ service ran between Ditton Junction and St Helens Shaw Street and was given the name of ‘Ditton Dodger’ by the locals who used it. The service proved popular and it was not long before the ‘railmotor’ was inadequate for the service and it was replaced by Webb Tank locomotives and Coaches which could be operated as ‘Push and Pull’ sets. The name ‘Ditton Dodger’ however stuck and the service was referred to by this name until it ceased to run. On the 1 January 1923 Union Bank Farm Halt became part of the London Midland & Scottish Railway (LMS). Very little changed though and the service continued to run between Ditton Junction and St Helens Shaw Street. The LMS Summer Timetable for 1932 had thirteen trains leaving Union Bank Farm for St Helens and thirteen trains for Ditton Junction on weekdays. Additional trains ran on Saturdays. During the Second World War the passenger service was cut back to only six trains per day in each direction and they ran only in the morning and evening peak hours. There were midday services on Saturdays for shoppers but in the main the line was given over to goods services and troop trains. At the end of the War the services at Union Bank Farm remained sparse. On 1 January 1948 Union Bank Farm Halt became part of the nationalised British Railways (London Midland Region). British Railways wanted to concentrate on goods services and so they proposed that passenger services on the line be withdrawn. Despite local protest and despite the replacement bus service taking considerably longer passenger services were withdrawn on 16 June 1951 and Union Bank Farm Halt closed completely. It was demolished shortly after closure. 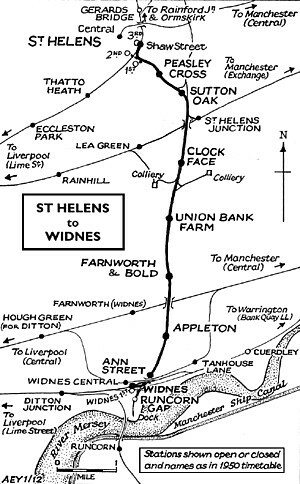 In December 1967 the line from Widnes Junction to St Helens was reduced to goods line status although interestingly diverted passenger services continued to use it right up until the early 1980s. With effect from 14 December 1969 the line through Union Bank Farm Halt was singled from a point to the north of Farnworth & Bold station through to Sutton Oak Junction signalbox. British Rail announced its intention to close the Widnes to St Helens line in 1981 but as it had been thirty years since passenger services had run the decision caused no protest. 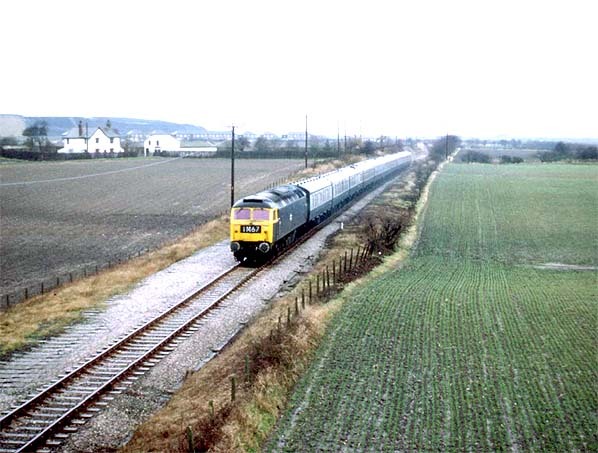 The line closed as a through route on the 1 November 1981 but the last movement through Union Bank Farm had been a light engine on route from Garston to Wigan on 31 October 1981. Track lifting had begun by December 1981 and in January 1982 only sleepers remained. In the Spring of 2014 work began on the creation of a footpath/cycleway along the course of the line between Clock Face and north Widnes. 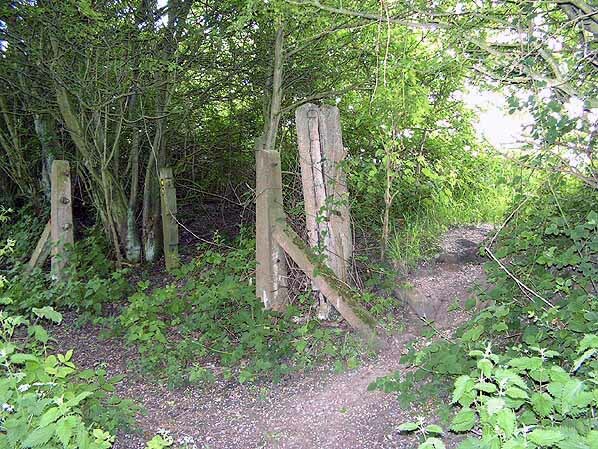 The construction of the footpath/cycleway required the vegetation to be cut back which exposed many railway related features. The works also exposed the site of the Union Bank Farm Halt platforms. Union Bank Farm Halt looking south in LNWR days. The basic facilities at the halt are clearly shown. The halt was provided with short platforms as it was originally intended that it would be served by a single coach ‘Railmotor’. Within a few years of the Halt being opened in 1911 the railmotor was replaced by Webb Tank Locomotives which hauled two coaches and which could operate in Push & Pull mode. The Railmotor had been given the nickname of the ‘Ditton Dodger’ and it continued to be used by locals when the locomotive and coach hauled service was introduced. 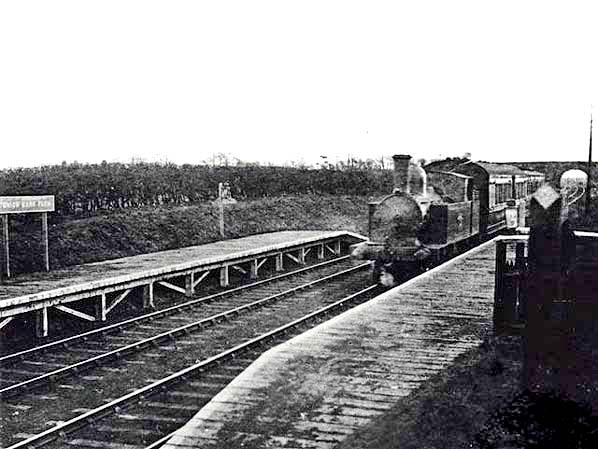 In this view the ‘Ditton Dodger’ service is seen arriving at Union Bank Farm Halt on its way to St Helens. A LNWR Webb Tank locomotive is at the front of the train of two coaches operating in ‘pull’ mode. Upon arrival at St Helens the engine would operate in ‘push’ mode back to Ditton with the driver sitting in a driving compartment in the coach that would have become the front of the train. The fireman would stay with the engine and operate controls as instructed by the driver through a series of pulleys and cables. Union Bank Farm Halt shown on a 1927 OS map. Looking north towards the site of Union Bank Farm Halt in the early months of 1976. A diverted Newcastle to Liverpool Lime Street train is seen passing through the site of the halt which roughly at its mid-point. 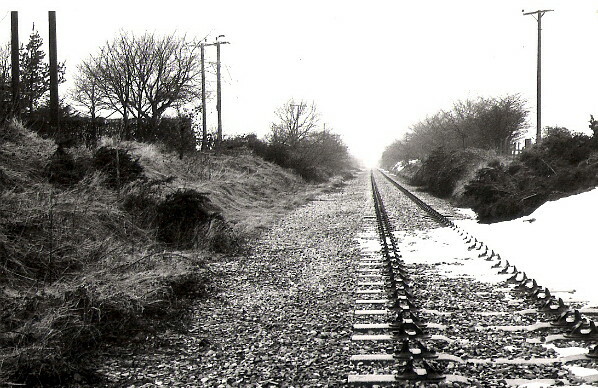 Sleepers from the lifted up line can be seen to the left of the former down line which had become the up and down line on 14 December 1969. Union Bank Farm Halt looking north on 2 January 1982. The rails had recently been lifted and only sleepers remained. Looking north towards the site of Union Bank Farm Halt on 2 June 2011. The site of Union Bank Farm Halt looking south on 16 August 2014.